On a more figurative level, Wyndham was warning the West to look out for the lumbering menace crouched behind the Iron Curtain, waiting to swallow up the world’s capitalist democracies at any time. But the singular event that heralds the rise of our vegetable overlords was not an instantaneous extermination of the animal kingdom. Rather, it began with a widespread plague of blindness. The sightless masses stumbled through a crumbling society as the triffids rose up to devour them slowly. And the people had no idea what was coming until too late. There’s a cybersecurity analogy in there, hidden beneath layers of leafy menace. Malicious actors can render our communications infrastructure blind, in essence, while our resources are gobbled up by unseen invaders. And the likelihood of you or your network falling victim to malicious activity is likely greater than that of you getting eaten by your fichus. But in either case, the illusion that it can’t happen to you is no true protection. Preparation is key. 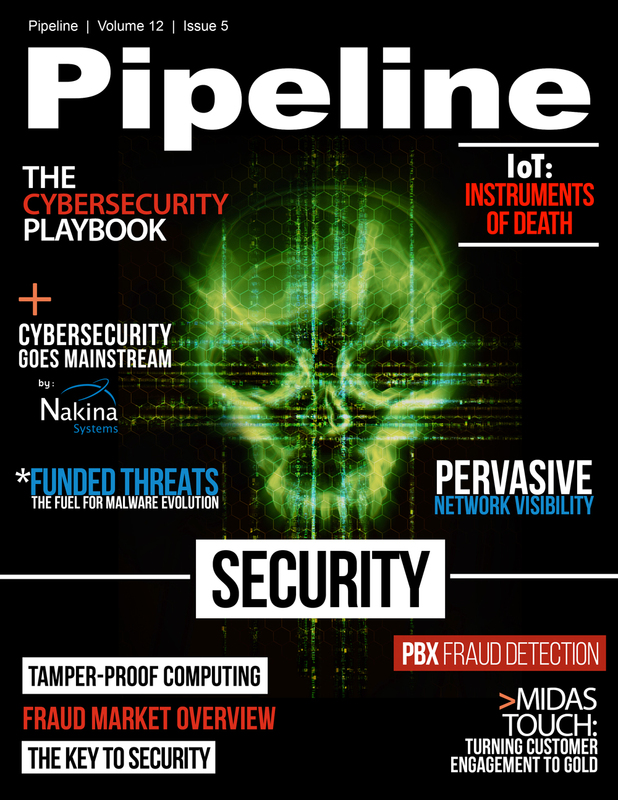 In this issue of Pipeline, we discuss the state of network security. Hackers, vandals, governmental actors, spies, thieves and countless others are on the prowl for data, exploiting weaknesses and creating breaches. How can carriers and other interested parties create secure, resilient networks to protect subscribers of all sizes and types? We’ll discuss PBX fraud detection, funded threats, network visibility, and securing customer behavior. We’ll also hear from industry expert Wedge Greene on the added challenges of the Internet of Things when it comes to maintaining security and privacy. In addition, we’ll talk about security in places it hasn’t always been before: in virtual environments and on individual chips. We’ll also crack open our cybersecurity playbook and talk about the latest industry news.